Despite high rates of institutional delivery (80% overall, 74% in rural areas) in the DRC, maternal and newborn mortality remain high at 846 per 100,000 live births and 28 per 1,000 lives birth, respectively. Rural zones fare worse—the newborn mortality rate is 31 per 1,000 live births in rural areas, as compared to urban areas where the mortality rate is 28 per 1,000 live births. 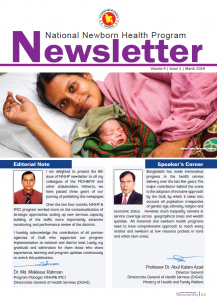 Through project monitoring in 78 rural health zones, 38 of which are priority areas, IHPplus identified that poor quality obstetric and newborn care was a major obstacle to improving maternal and newborn survival. 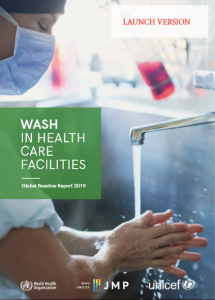 For example, only 47% of hospitals provided comprehensive emergency obstetric and newborn care (EmONC), and less than 15% of health centers provided basic EmONC. Strengthening information systems to support health data use is a critical component of quality improvement. In the past, research on quality of care has focused on the availability of resources and implementation of clinical guidelines, while often ignoring the regular metrics and monitoring systems used to inform decision making and manage improvement initiatives. Recognizing the lack of standardized global indicators, in 2013, the World Health Organization (WHO) and the Partnership for Maternal, Newborn, and Child Health (PMNCH), with the participation of numerous stakeholders, identified 13 indicators for assessing the quality of health care provided to mothers, newborns, and children in health facilities. These global core indicators, however, required further testing to determine the feasibility of collection and measurement. 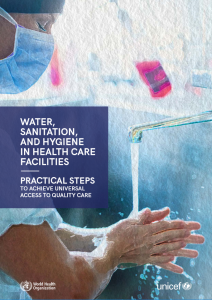 As part of IHPplus, MSH focused on improving the quality of maternal and newborn health services in DRC and contributing to the growing body of work on data quality and use at the health facility level. IHPplus supported competency-based training in maternal and newborn health practices in 362 facilities as well as provision of registers and tools for data collection. The Ministry of Health’s (MOH) revised approach to capacity building, which consisted of a 15-day training facilitated by gynecologists, obstetricians, and pediatricians, was used. The training included theoretical components, practice on mannequins, and clinical placements. 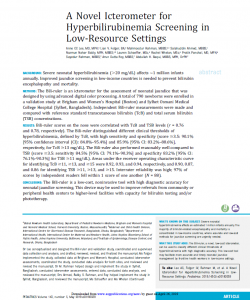 IHPplus wanted to understand what more was needed to support routine use of data for quality improvement. Thus, IHPplus, with the DRC’s MOH and the University of Kinshasa’s School of Public Health (UK-SPH), embarked on a study to evaluate the availability, quality, and utility of selected WHO-proposed indicators for assessing the quality of maternal and newborn health care in health facilities. Nine of the 13 indicators proposed in the WHO consultation were selected for the study, focusing on indicators related to maternal and newborn health and excluding those that were outside the scope of IHPplus or not feasible to collect at the health center level. The final set included four related to maternal health, three related to newborn health, and two general indicators. 1. 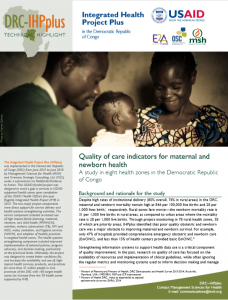 What is the availability and quality of data for the nine maternal and newborn health quality-of-care indicators at the facility level in DRC in IHPplus-supported sites as compared to others? 2. How are essential maternal and newborn health data used in health facilities? 3. 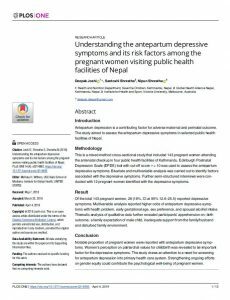 How can the MOH and IHPplus best support health facilities to monitor and improve quality of care for mothers and newborns?